In January 2018, the University of Mississippi will be submitting a Center of Biomedical Research Excellent (COBRE) Phase I proposal to the National Institutes of Health entitled “GlyCORE: The Glycomics Center of Research Excellence”. The development of Research Cores to support glycoscience and related research on campus. The establishment of a rotating set of 3-year Junior Investigator projects. The development of a Pilot Project program. Letters of Intent are encouraged from faculty interested in conducting research in the field of Glycoscience. Click here for more details about the project, funding opportunity, and the call for letters. Letters of Intent are due October 31, 2017. Priority will be given to projects that are most relevant to GlyCORE (Glycomics Center of Research Excellence) Research Cores, including analytical and biophysical core (initially focused on high resolution mass spectrometry); imaging core (initially focused on confocal and optical microscopy); computational chemistry and bioinformatics core. Please email the letter of intent to: Joshua Sharp, Assistant Professor, and Samir Ross, Professor, Pharmacognosy. 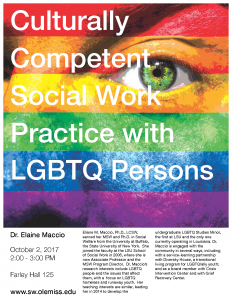 Please join the Department of Social Work in welcoming Dr. Elaine Maccio to campus for her presentation, Culturally Competent Social Work Practice with LGBTQ Persons, in Farley Hall 124 from 2-3 p.m. on Oct.2. Dr. Maccio is also presenting on Queer History: The Evolution of Culture and Identity from 4-6 p.m. that evening for the Sarah Isom Center in Lamar 132. 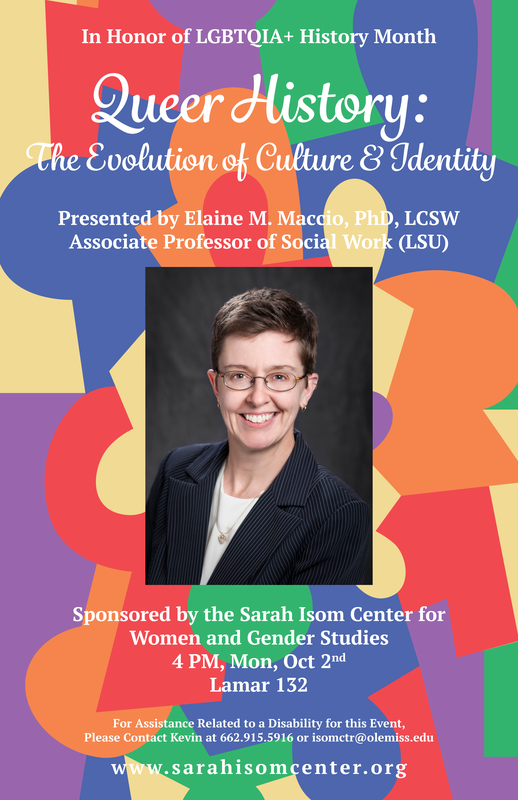 We applaud the joint effort between Social Work and the Sarah Isom Center to bring Dr. Maccio to campus. Elaine M. Maccio, Ph.D., LCSW, earned her MSW and Ph.D. in Social Welfare from the University at Buffalo, the State University of New York. She joined the faculty at the LSU School of Social Work in 2006, where she is now Associate Professor and the MSW Program Director. 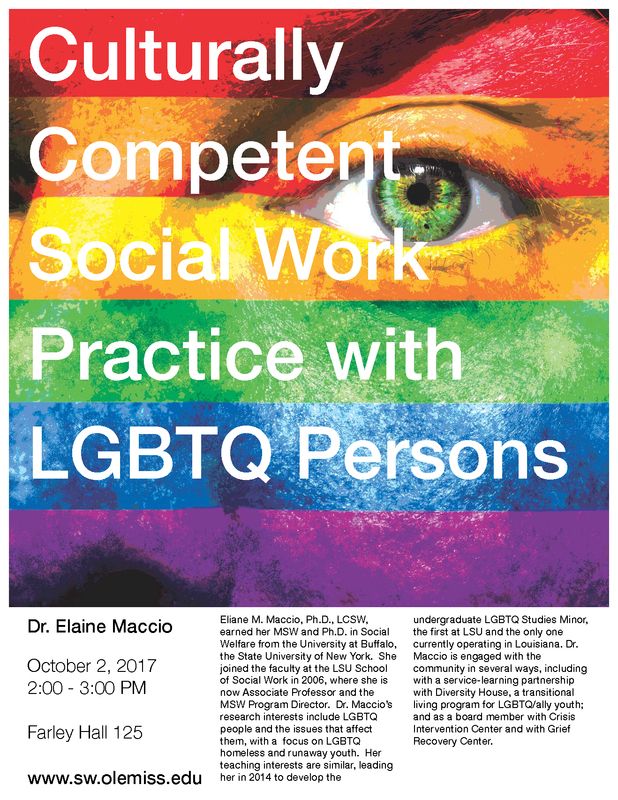 Dr. Maccio’s research interests include LGBTQ people and the issues that affect them, with a focus on LGBTQ homeless and runaway youth. Her teaching interests are similar, leading her in 2014 to develop the undergraduate LGBTQ Studies Minor, the first at LSU and the only one currently operating in Louisiana. Dr. Maccio is engaged with the community in several ways, including with a service-learning partnership with Diversity House, a transitional living program for LGBTQ/ally youth; and as a board member with Crisis Intervention Center and with Grief Recovery Center. The message below is from the McLean Institute for Public Service and Community Engagement Director and Professor of Sociology, Albert Nylander, Ph.D. He has petitioned our help to guide the development of a Civic Action Plan for the University of Mississippi. Please take the survey at your earliest convenience by clicking the survey link in his message below. I hope this message finds you well. I am writing to make you aware of a survey that will help guide the development of a Civic Action Plan for the University of Mississippi. As a valued partner of the McLean Institute for Public Service and Community Engagement and the Office of Community Engagement and Service Learning at UMMC, we hope that you will engage with this planning process to share your vision and ideas for how the University of Mississippi can fully realize its public purpose in our state. We foster an environment that consistently affirms the centrality of the public purpose of higher education by setting high expectations for members of the campus community to contribute to their achievement. By signing the action statement, the university committed to create a Civic Action Plan to serve as a framework for how to fully embody the core commitments above. We are reaching out to invite you to complete this survey, which will provide valuable input regarding the university’s public impact.